So you’re coming to the most beautiful city in the world… and you’ve only given yourself 24 hours to see it!? Change your flights amigos, tell your boss your favourite uncle died, or that you’ve contracted dysentery… do whatever it takes to spend longer! 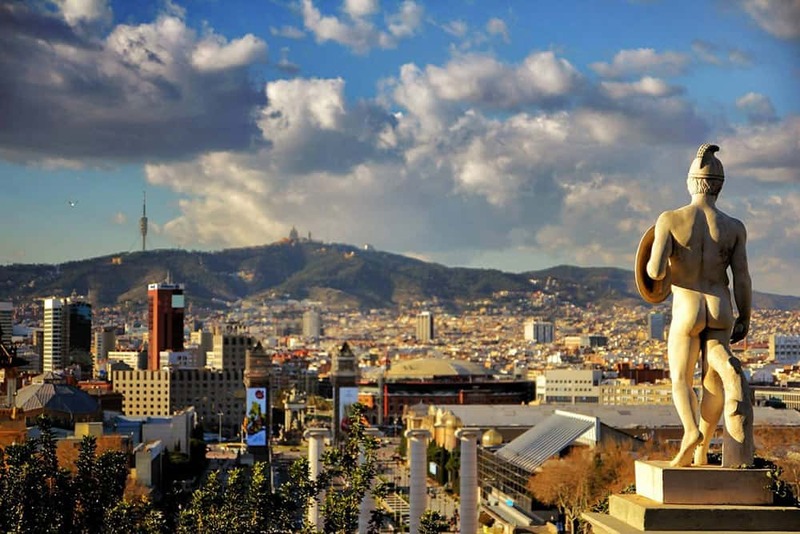 There are so many amazing things to do in Barcelona, that one day is never enough…. just check our 2, 3, 4 and 5 day itineraries (all coming soon! ), to see what I mean. 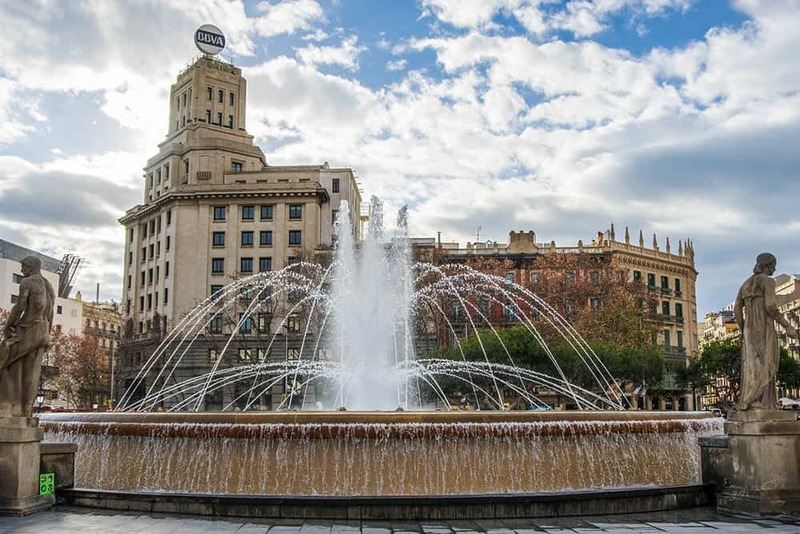 No slouching, I expect you to be showered, dressed and breakfasted by now, and you should have made your way to Plaça Catalunya, the central square. The day starts here, at Placa Catalunya…. From here make your way up the magnificent boulevard Passeig de Gracia by foot. This has to be one of the best looking streets in the world. Keep going until you reach the so called ‘Block of Discord’, a single block that showcases three of Barcelona’s best architects in one go, starting with the Casa Lleo i Morera (by Luis Domenech i Montaner), the Casa Amatller (by Puig y Cadalfach) and finishing with the astonishing Casa Batllo, by none other than Antoni Gaudi. The Casa Amatller (left), and the Casa Batllo, on the Block of Discord. The embarrassment of architectural riches continues on the other side of the street with Gaudi’s Casa Mila, a vast monolithic mansion with curves like Kim Kardashian. You don’t have to be religious to sense the divine in this breathtaking homage to the big guy upstairs. 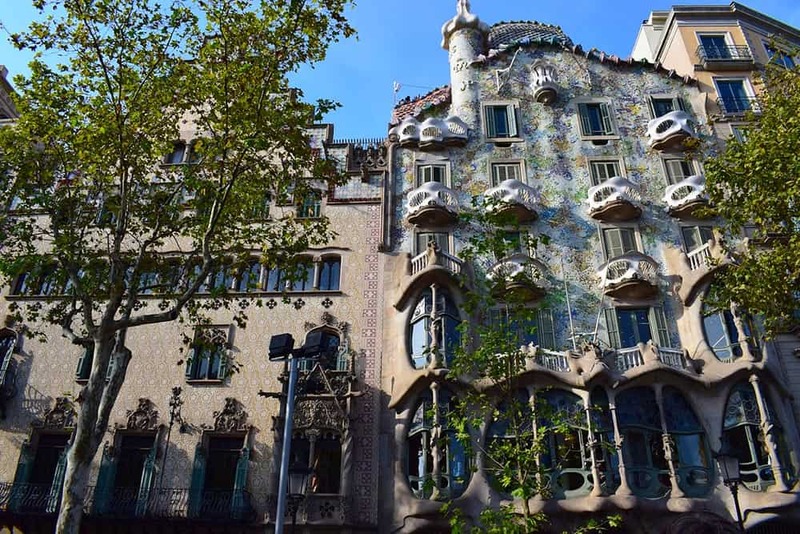 Gaudi was a fervent Catholic and he dedicated the later years of his life to this impossibly grandiose edifice, whose every square foot is decorated in religious allegories, natural motifs and mathematical equations. This one you can’t miss, so buy yourself a skip-the-line ticket. Personally I would advise buying a ticket that includes audioguide and access to one of the basilica’s epic towers (Passion or Nativity – click on the links to buy them via Get Your Guide), but if you want to save a bit of time and money the standard ticket is fine. However mesmerising La Sagrada proves, don’t tarry too long… you need to hustle and get back on the tourist bus. 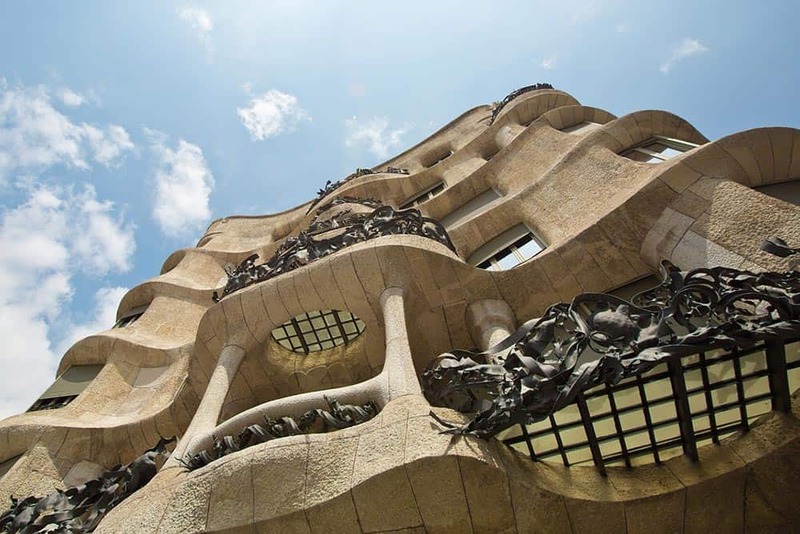 Your love affair with Gaudi ain’t over yet. Excuse me for a minute whilst I get nostalgic for the times when Parc Guell was free and I used to pop up there just to enjoy the serene beauty of the place. Sadly, in these days of readily accessible travel, we now have to wait our turn (and pay!) for such privileges – so please go online and book your tickets in advance (you’ve got a loooonng wait if you don’t!). Once you’ve passed through the art nouveau gates of Gaudi’s garden, you’ll soon see what all the fuss is about. From the majestic white staircase, with techni-colour lizard on guard, to the wide open terrace with undulating trencadis-covered benches and views over almost the entire city, this is a special place. Oh what the hell, take a selfie… everyone else is! Lunch time! 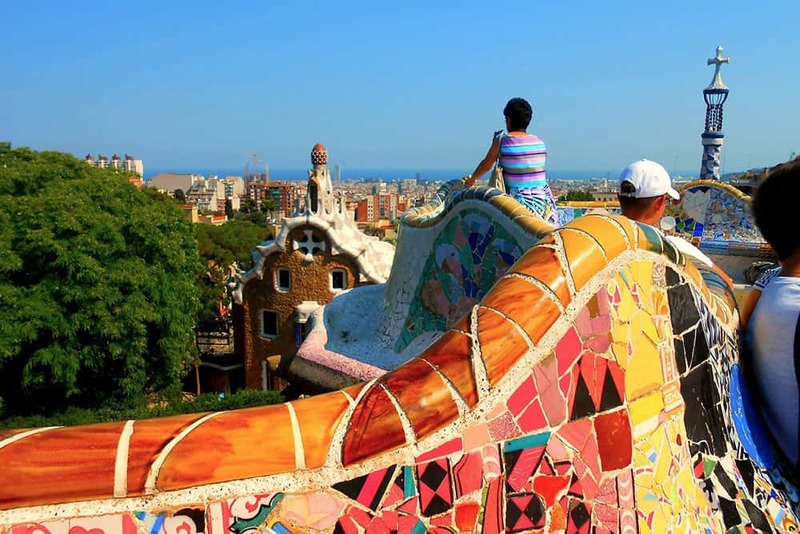 Leave yourself about 15 or 20 minutes and descend from Park Guell down into the chic Bohemian district of Gracia. This used to be a separate village to Barcelona, and indeed the (fiercely Catalan) locals still consider themselves distinct from downtowners. The barri is chock-full of affordable tapas bars and restaurants, so take your pick. 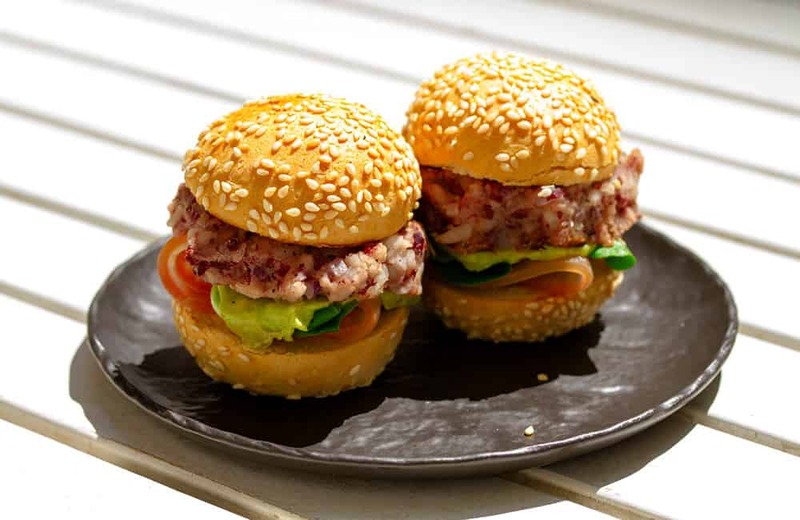 Or if you want to take my advice, drop in on Intrepid de Gracia for modern tapas including mini-burgers and bagels. It’s time to get back to the tourist bus stop, and ride it all the way, through the pleasant Zona Alta neighbourhoods, to the other side of the city where the legendary Camp Nou football stadium awaits. Depending on whether you’re a sports fan or not, you might want to get off here and take the excellent stadium tour with museum visit. You can buy advance tickets via the city’s official tourism site. The 16:00 time slot should fit this itinerary (it might take a bit over an hour to get there via tourist bus after lunch, 30-40 mins on the bus, plus the time you need to get from the restaurant to the bus stop and wait for the next bus to arrive). Otherwise just enjoy the bus tour of the city and alight at Fransesca Masia stop, where you’re going to change onto the red line of the tourist bus route. 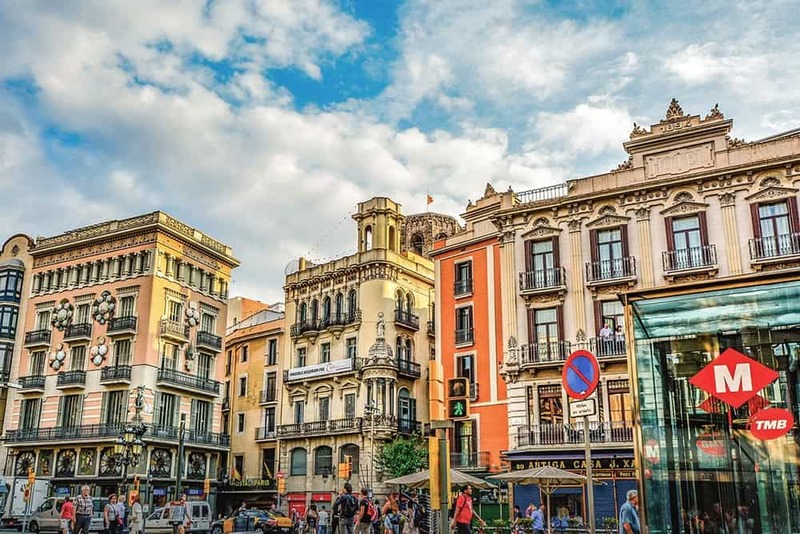 From here the bus will take you to Plaça Espanya, where you will spy the eye-catching Las Arenas shopping centre (it was once a bullfighting arena), before taking a very enjoyable ride through the leafy hills of Montjuic mountain. This green space is full of parkland and cultural treasures, and you might want to alight at any of the Joan Miro Foundation, Olympic Stadium, or Miramar viewing point, if you have time. Calculating for 2 or so hours riding the bus (including waiting times) and around 1 hour or so for attractions, you should reach the Columbus Statue around 18:00 with a bit of luck. 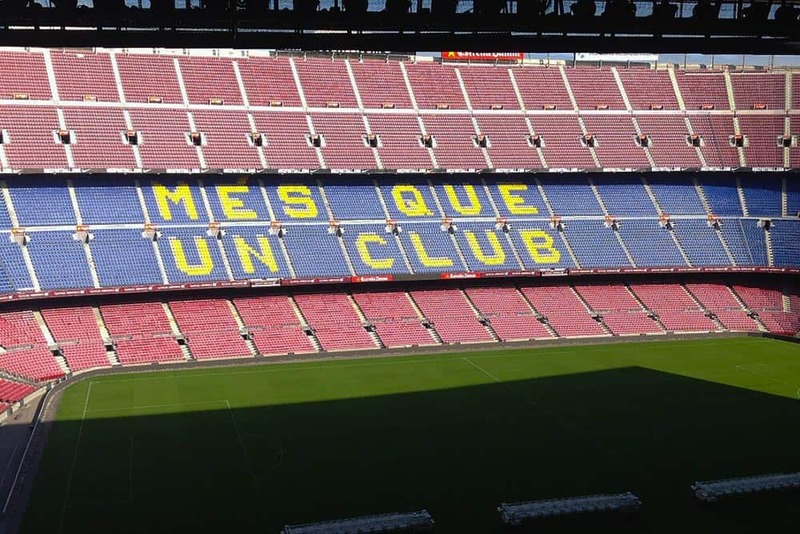 (If you stopped for Camp Nou you’re probably behind schedule, so plan accordingly!). The big column with the New World explorer on top is your sign to get off the bus. You’re at the bottom of Las Ramblas, the city’s (in)famous thoroughfare. You wouldn’t want to have to cross this street every day as its positively jam-packed with tourists, but on the other hand, you wouldn’t want to miss it either. You can read more here. As you head up Las Ramblas, navigate a little bit to the right in order to discover the lively Plaça Reial, possibly my favourite square in the city. Whilst on the left you’ll pass not only La Boqueria food market (pop in and get yourself some freshly squeezed juice) but also the historic Liceu Theatre. You’ll also pass all manner of artists, street performers, vendors, hawkers, florists, kiosks and souvenir sellers. If it’s cold outside you could nip down to Petrixol street and grab a hot chocolate from one of the traditional cafes there. After that it’s time to get back to your hotel and get changed for the evening. If you really want to do it all in one day, then round off your Barcelona itinerary with a flamenco show and dinner. 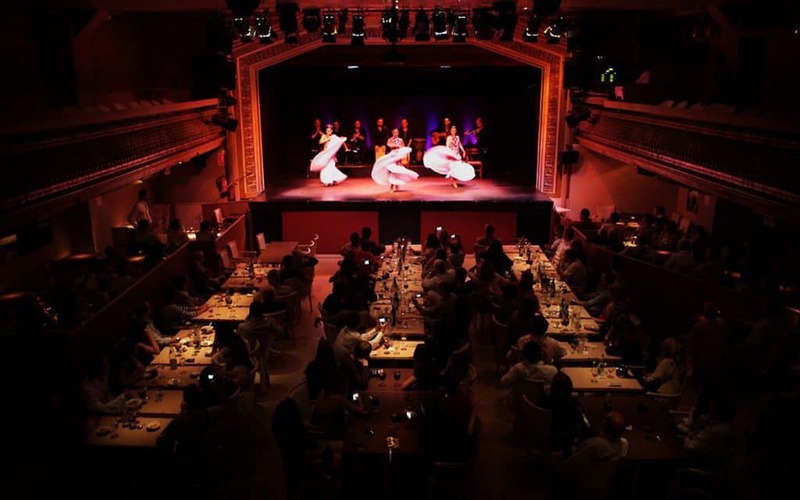 There are several great tablaos to choose from, and I’d suggest either this affordable tapas and flamenco experience (meeting time 19:45), or a show at Palacio del Flamenco complete with a classic Spanish paella. The latter offers three shows a night (start times are 18:00, 19:55 or 21:50 with dinner), so check the times for which might work for you. They tend to sell out so best to buy tickets via Get Your Guide (select the date first, and then you will see several different meal options and times). If flamenco isn’t your bag baby, then you can’t go wrong with dinner at El Nacional, where four different restaurants and four more bars offer tastes from all corners of Spain. More things to do at night here. You’ve really packed it in today, so reward yourself with a nice refreshing beer or mojito. If you went to the Palacio del Flamenco, you are nearby Slow cocktail bar. 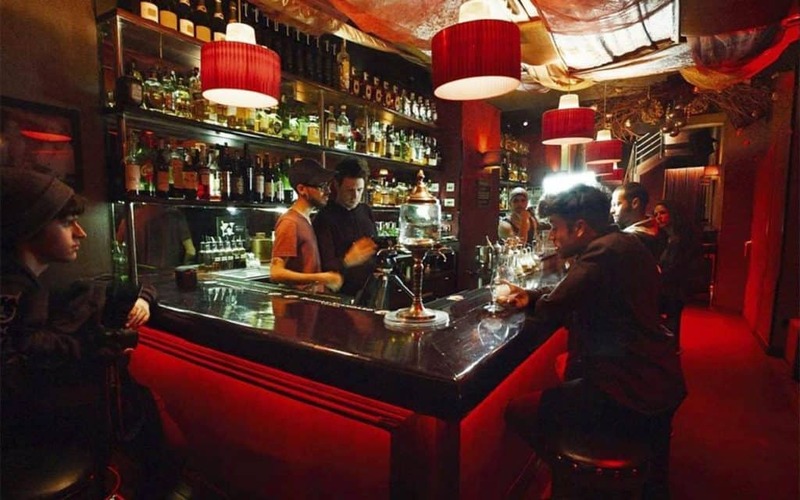 If you went to the flamenco and tapas evening, head over to Milk, or one of the bars on Plaça Reial (I like Ocaña the best). If you went to El Nacional for dinner saunter back to Boadas cocktail bar or Marmalade. Bed time! 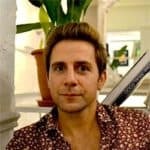 Unless of course you truly want to make this a 24 hours in Barcelona experience and party until dawn with the city’s cool cats and nightowls. In that case let me present to you our guide to the local nightlife. 18:45 – Drop your stuff back at your hotel (book one near Plaça Catalunya). 19:45 or 19:55 – Flamenco concert with dinner (Tickets here. Book a late show, at 21:50, if you prefer a more relaxed afternoon). 00:00 – Bedtime (or is it?). 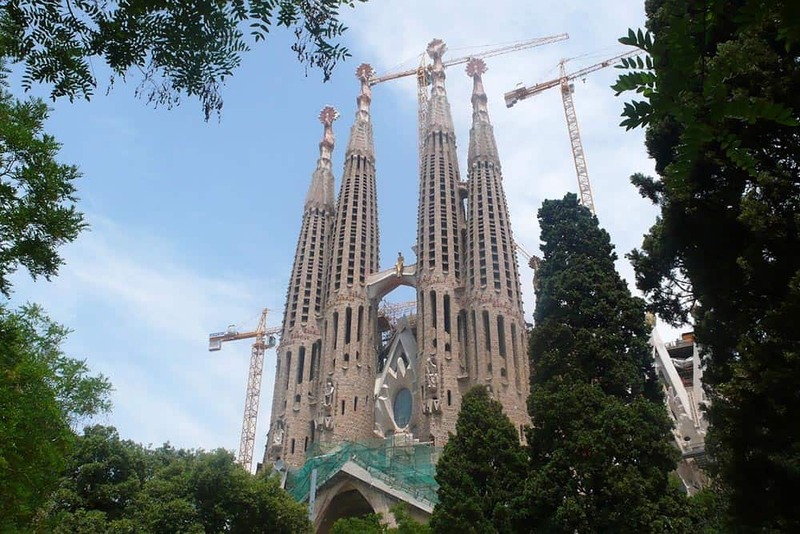 If you don’t fancy riding the tourist bus, or want to save yourself €30, you could grab the metro (or even walk, it’s not that far) to Sagrada Familia from Casa Mila, and then later take the metro from Sagrada Familia to get to Park Guell. Afterwards you could metro back into town and do Las Ramblas and the Gothic Quarter at a leisurely pace, as well as wander around El Born. 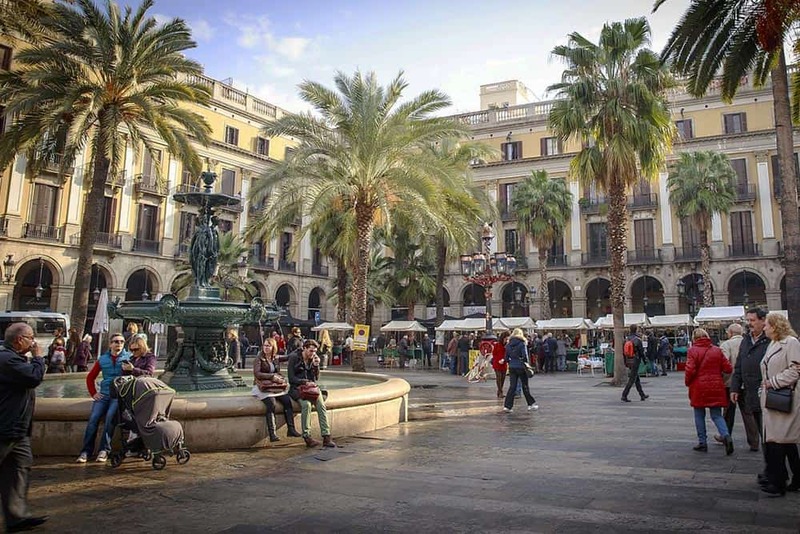 Highlights in these zones are not only the aforementioned Plaça Reial and Boqueria market, but also the Gothic Cathedral, the Passeig del Born and the Picasso Museum. This would probably give you more control, and time to get ready, if you have booked flamenco tickets in the evening. If you want someone else to do all your thinking and planning for you, this 5 hour Barcelona highlights tour does a pretty excellent job. It follows an almost identical route to the one I mapped out (great minds! ), beginning with a ride up the Passeig de Gracia, followed by a guided tour of La Sagrada Familia, and then a jaunt around Montjuic. On Montjuic you stop off at Poble Espanyol – a weird but fun relic of the Universal Exhibition of 1929, as well as seeing the Olympic Stadium and one or two other worthwhile sights. The tour doesn’t include Park Guell, so you could either buy tickets for that yourself for the afternoon (around sunset is always a good time! ), or head into the Gothic Quarter for a meander. For this schedule to work, and for general convenience, you should book a hotel near Placa Catalunya. Some specific recommendations coming soon. I tried to leave as much time as might be needed to get from a. to b. during this itinerary, but if you are buying tickets with specific entry times be sure to double check you will make it in each case. If you are travelling with children, stop for excessive amount of selfies, enjoy long lunches or get unlucky with the buses / traffic, you may hit some of these stops later than I project. Also, as ever with Barcelona, be vigilant about pickpockets, especially on the metro, Las Ramblas, and in the winding streets of the old town (Gothic Quarter, El Born etc. ).